We spoke to composer and harpist Ailie Robertson about her work and featured programmes at Borough New Music, Series 12. HH: What is your favourite piece of music to perform and why? AR: My favourite contemporary piece is Sergiu Natra's Sonatina for Harp (1965), because it was the first contemporary piece I learnt for the instrument. I hated it at first, but slowly grew to love it and that process completely changed my thoughts on new music. HH: How did you select the repertoire for your recent Borough New Music concert with the Trinity Laban Harp Department on the 15th January 2019? AR: I was really interested in finding a programme all written by female composers, and had a great time researching pieces and finding some new ones that I hadn't known before. HH: Can you tell us more about your connection with Trinity Laban and Gabriella Dall'Olio? AR: For the past 4 years I've been doing a PhD at Trinity Laban in composition for the harp, so I've been very closely aligned with both the composition and harp departments. Gabriella is head of harp at the institution, she is such an amazing, positive force there, and a huge supporter of new music for the instrument, so I'm really lucky to have got to work with her. HH: At Borough New Music on the 22nd January 2019 you are performing a concert of works for Camac Electro Harp. How does the Camac Electro Harp differ from an acoustic harp, and how is this reflected in the repertoire that is written for the instrument? AR: The Electro Harp has a piezo pickup microphone on every string, meaning it can be amplified very easily. This means it's much easier to process the sounds of the instrument in a very accurate way with electronics etc. HH: Can you tell us more about Will Handysides' new commission for the Camac Electroharp that will be premiered at this concert on the 22nd January? AR: Will's piece is called for the ducks, and has been written for electric lever harp. it's a very hypnotic, minimalistic piece, that explores the resonance of the instrument. HH: We are delighted to have hosted the world premiere of your piece 'Grey' on the 15th January. Can you tell us more about this piece? AR: Grey is a homesick bariolage written on a grey, dreary day in Germany, longing for the dreariness of Scotland. It takes a gesture that is idiomatic to the harp, the bisbigliando, but rather than use it as just an effect, it is used as the structure for the whole piece. AR: The Seven Sorrows began as a commission from the Celtic Connections festival in Scotland, for harp, voice and string quartet, that explored the Scottish and Irish keening traditions. The version I'll present at BNM is just for solo harp and electronics, but listeners will hear various archive fragments, alongside contemporary harp techniques. HH: As a composer / performer, when you are writing for harp do you tend to write with the instrument to hand or away from the instrument, or a combination of the two? AR: Normally a combination of the two - I find that sometimes writing away from it can be good, as there is a tendency to fall into familiar hand shapes or gestures when composing at the instrument, but of course writing at an instrument always makes the composition more idiomatic. HH: Do you use improvisation on your instrument as a compositional tool? AR: Yes - all the time. I don't tend to rely on fixed processes very much as a composer - I much prefer a more free approach, based solely on the sounds that I find interesting, so improvisation plays a big part in that. HH: You have such a rich and multi-faceted career as a musician - as a member of folk-band The Outside Track, as a prolific composer of contemporary music (with recent premieres by Bang on a Can and London Philharmonic Orchestra and composer residencies with Sound Festival and Glyndebourne), as an educator (recently appointed Lecturer at Royal Conservatoire Scotland) and performer. Can you tell us more about how these different aspects of your career feed into, influence and support one another? AR: I've always had a very diverse career and I think that's really important as a musician. All the different experiences and ways of working feed into each other, and give me a really broad range of skills to work with. I think the important thing is always to keep learning, and all these different opportunities continue to stretch me in new ways all the time, and open up new collaborations etc. HH: Is there a secret behind your success? What advice can you offer to aspiring composers? AR: Haha, just tenacity, I guess! I think listening to as much as you can, going to see as much as you can, and also just being a nice person to work with, go a long way! HH: What events or releases do you have coming up? AR: I'm going to be releasing a CD of experimental harp music in October, so I'm planning that at the moment, which is exciting and I'm working on a big commission for Sound festival 2019, which is for Exaudi and a community choir. I'm also developing my first opera at the moment, which is very exciting. 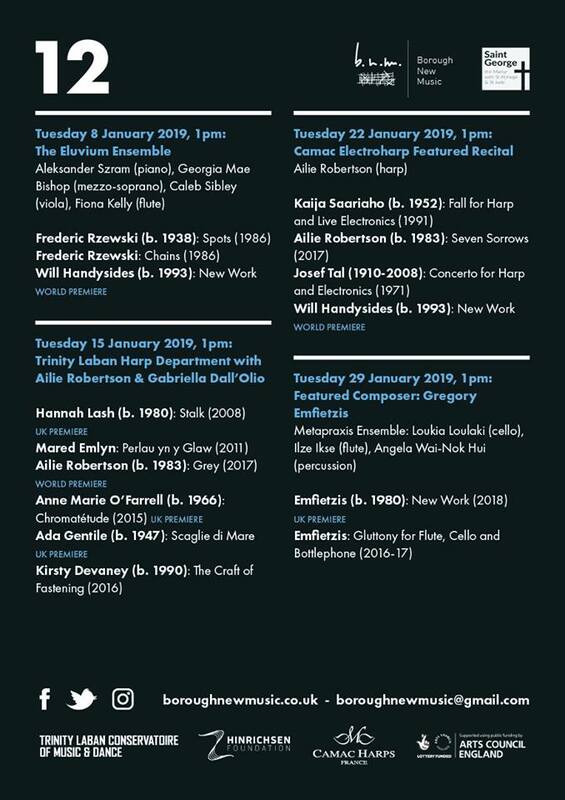 You can hear Ailie performing a selection of works for Camac Electroharp, including her own 'The Seven Sorrows' and a premiere of Will Handysides' 'for the ducks' at Borough New Music on the 22nd January. Full details for Series 12, below!